Red No. 3: Fat Hate Bingo 2! There were just too many good ideas for one Bingo Card, so we present FAT HATE BINGO 2! Continuing to prove we've heard it all before, now you can play along with a friend and see who gets BINGO first. FAT HATE BINGO and FAT HATE BINGO 2 materials are both available at my self-important CafePress store. I just have a basic account, so they have to be in different styles. Why do I have a basic account? Seriously, I know you're not buying the stuff. It just amuses me that you potentially could. 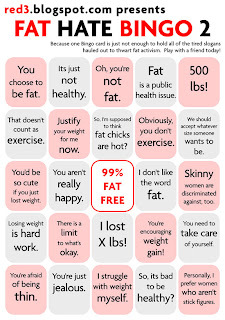 So, without further adieu, click on the image below for FAT HATE BINGO 2! I'm still learning about the Fat Hate culture after many years of experiencing it - could you explain the "We should accept whatever size someone wants to be" box? I think I'm looking at it the wrong way. Basically, its the kind of thing people say when they are trying to recenter a discussion away from the actually marginalized (fat people) and make it into something about dieter's rights. The whole co-opting of body autonomy language by dieters is a troubling theme because at its heart its pushing the narrative that we all have the capacity to be whatever size we wish we could be and that's simply not true. But trying to push the discussion into this direction, they are actually pushing for an admission that fat is a choice and as such, fat hate isn't a serious concern since we could just do something about it. The reality is, no one is stopping people who have been coached to think they should be a smaller size from attempting to alter their size. The notion of this being imperiled is a straw man which only serves to take focus away from those trying to forge a different path who find our lives very much disenfranchised. Fat Hate Bingo: Now in T-Shirts! The mirror says "You are Beautiful"
Don't post diet spam here.